Equisetopsida, or Sphenopsida, is a class of vascular plants with a fossil record going back to the Devonian. They are commonly known as horsetails. Living horsetails are represented by about twenty herbaceous species in the single genus Equisetum. They typically grow in wet areas, with whorls of needle-like branches radiating at regular intervals from a single vertical stem. The Equisetopsida were formerly regarded as a separate division of spore plants and also called Equisetophyta, Arthrophyta, Calamophyta or Sphenophyta; today they have been recognized as rather close relatives of the typical ferns (Pteridopsida) and form a specialized lineage of the Pteridophyta. However, the division between the Equisetopsids and the ferns is so ancient that many botanists, especially paleobotanists, still regard this group as fundamentally separate at the higher level. The Sphenophytes comprise photosynthesising, "segmented", hollow stems, sometimes filled with pith. At the junction ("node", see diagram) between each segment is a whorl of leaves. In the only extant genus Equisetum, these are small leaves (microphylls) with a singular vascular trace, fused into a sheath at each stem node. However, the leaves of Equisetum probably arose by the reduction of megaphylls, as evidenced by early fossil forms such as Sphenophyllum, in which the leaves are broad with branching veins. The vascular bundles trifurcate at the nodes, with the central branch becoming the vein of a microphyll, and the other two moving left and right to merge with the new branches of their neighbours. The vascular system itself resembles that of the vascular plants' eustele, which evolved independently and convergently. Very rapid internode elongation results in the formation of a pith cavity and a ring of carinal canals formed by disruption of the primary xylem. Similar spaces, the vallecular canals are formed in the cortex. Due to the softer nature of the phloem, these are very rarely seen in fossil instances. In the Calamitaceae, secondary xylem (but not secondary phloem) was secreted as the cambium grew outwards, producing a woody stem, and allowing the plants to grow as high as 10m. All extant species of Equisetum are herbaceous, and have lost the ability to produce secondary growth. The underground parts of the plants consist of jointed rhizomes, from which roots and aerial axes emerge. The plants have intercalary meristems in each segment of the stem and rhizome that grow as the plant gets taller. This contrasts with the seed plants, which grow from an apical meristem - i.e. new growth comes only from growing tips (and widening of stems). Sphenophytes bear cones (technically strobili, sing. strobilus) at the tips of some stems. These cones comprise spirally arranged sporangiophores, which bear sporangia at their edges, and in extant sphenophytes cover the spores externally - like sacs hanging from an umbrella, with its handle embedded in the axis of the cone. In extinct groups, further protection was afforded to the spores by the presence of whorls of bracts - big pointed microphylls protruding from the cone. The extant horsetails are homosporous, but extinct heterosporous species such as Calamostachys casheana appear in the fossil record. The sporangia open by lateral dehiscence to release the spores. The spores bear characteristic elaters, distinctive spring-like attachments which are hygroscopic: i.e. they change their configuration in the presence of water, helping the spores move and aiding their dispersal. Cross-section through a strobilus; sporangiophores, with attached sporangia (spore capsules) full of spores, can be discerned. The extant horsetails represent a tiny fraction of Sphenophyte diversity in the past. There were three orders of Equisetopsid; the Pseudoborniales, which first appeared in the late Devonian. Second, the Sphenophyllales which were a dominant member of the Carboniferous understory, and prospered until the mid and early Permian respectively. The Equisetales existed alongside the Sphenophyllales, but diversified as that group disappeared into extinction, gradually dwindling in diversity to today's single genus Equisetum. The organisms first appear in the fossil record during the late Devonian, a time when land plants were undergoing a rapid diversification, with roots, seeds and leaves having only just evolved. (See Evolutionary history of plants) However, plants had already been on the land for almost a hundred million years, with the first evidence of land plants dating to 475 million years ago. 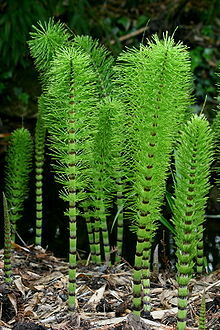 The horsetails and their fossil relatives have long been recognized as distinct from other seedless vascular plants. Before the advent of modern molecular studies, the relationship of this group to other living and fossil plants was considered problematic. Because of their unclear relationships, the rank botanists have assigned to the horsetails varies from order to division. When recognized as a separate division, the literature uses many possible names, including Arthrophyta, Calamophyta, Sphenophyta, or Equisetophyta. Other authors have regarded the same group as a class, either within a division consisting of the vascular plants or, more recently, within an expanded fern group. When ranked as a class, the group has been termed the Equisetopsida or Sphenopsida. Recent phylogenetic analysis has produced evidence that this group of plants belongs firmly within the fern clade of vascular plants. A 2006 classification by Smith et al. places the class Equisetopsida within an unranked clade of broadly defined ferns, as a sister to two classes more traditionally called ferns, Marattiopsida and Polypodiopsida. A recent study by Elgorriaga et al., (2018) suggests that Equisetaceae (containing Equisetum, Equisetites and Spaciinodum) conform the sister group of Neocalamitaceae, with both groups being sister of the group of Calamitaceae + A.G. clade (Angaran Gondwanan clade), with the four groups being in turn sister to Archaeocalamitaceae, conforming the Equisetales, sister to Sphenophyllales, i.e.. (Sphenophyllales,Archaeocalamitaceae, Calamitaceae, A.G. clade)(Neocalamitaceae, Equisetaceae). According to that study, the age of the crown group of Equisetum dates at least to the Early Cretaceous, and most probably up to the Jurassic. ^ a b c Taylor, T.N. ; Taylor., E.L. (1993). The biology and evolution of fossil plants. Englewood Cliffs, NJ: Prentice Hall. pp. 303–305. ISBN 978-0-13-651589-0. ^ Allaby, A.; Allaby, M. (1999). "Sphenopsida." A Dictionary of Earth Sciences. ^ Judd, W.S. ; Campbell, C.S. ; Kellogg, E.A. ; Stevens, P.F. ; Donoghue, M.J. (2002). Plant systematics, a phylogenetic approach. Sunderland, Massachusetts: Sinauer Associates, Inc. p. 193. ISBN 978-0878934034. ^ a b Smith, A.R. ; Pryer, K.M. ; Schuettpelz, E.; Korall, P.; Schneider, H.; Wolf, =P.G. (2006). "A classification for extant ferns" (PDF). Taxon. 55 (3): 705–731. doi:10.2307/25065646. JSTOR 25065646. Archived from the original (PDF) on 2008-02-26. ^ Rutishauser, R. (1999). "Polymerous leaf whorls in vascular plants: Developmental morphology and fuzziness of organ identities". International Journal of Plant Sciences. 160 (6): 81–103. doi:10.1086/314221. JSTOR 10.1086/314221. PMID 10572024. ^ a b c d e Stewart, W.N. ; Rothwell, G.W. (1993). Paleobotany and the evolution of plants (2nd ed.). Cambridge: Cambridge University Press. ISBN 978-0-521-38294-6. ^ Bower, F.O. (1959) . The origin of the land flora, a theory based upon the facts of alternation. New York: Hafner publishing Co. p. 381. ^ Taylor, T.N. ; Taylor, E.L. (1993). The Biology and Evolution of fossil plants. Prentice Hall. ISBN 978-0136515890. ^ Wellman, C.H. ; Osterloff, P.L. ; Mohiuddin, U. (2003). "Fragments of the earliest land plants" (PDF). Nature. 425 (6955): 282–285. doi:10.1038/nature01884. PMID 13679913. ^ Eames, A.J. (1936). Morphology of vascular plants (Lower Groups). New York and London: McGraw-Hill Book Company. pp. 110–115. ^ a b Bold, H.C.; Alexopoulos, C.J. ; Delevoryas, T. (1987). Morphology of Plants and Fungi (5th ed.). New York: Harper-Collins. pp. 371–387, 478, 506–514. ISBN 978-0-06-040839-8. ^ Gifford, E.M.; Foster, A.S. (1988). Morphology and evolution of vascular plants (3rd ed.). New York: W. H. Freeman and Company. pp. 175–207. ISBN 978-0-7167-1946-5. ^ Kenrick, P.; Crane, P.R. (1997). The Origin and early diversification of land plants: A cladistic study. Washington, D. C.: Smithsonian Institution Press. pp. 241–242. ISBN 978-1-56098-730-7. ^ Pryer, K.M. ; Schneider, H.; Smith, A.R. ; Cran, R.; Wolf, P.G. ; Hunt, J.S. ; Sipes, S.D. (2001). "Horsetails and ferns are a monophyletic group and the closest living relatives to seed plants" (PDF). Nature. 409 (6820): 618–621. doi:10.1038/35054555. PMID 11214320. Archived from the original (PDF) on 2009-09-02. Wikimedia Commons has media related to Equisetopsida.